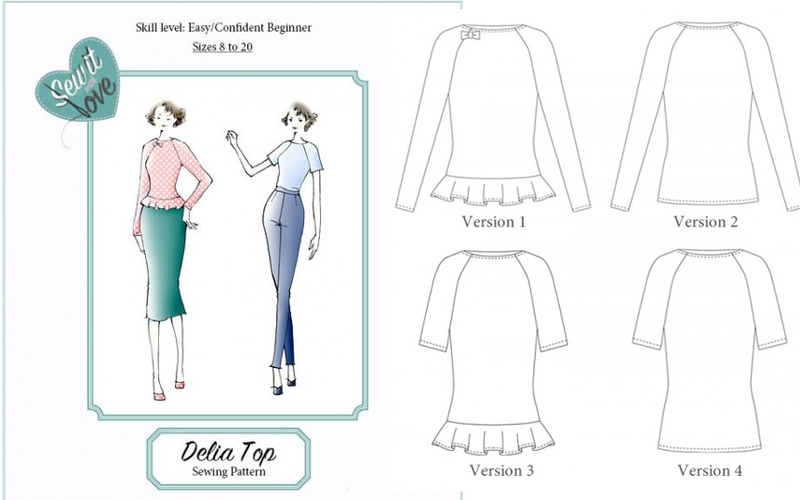 I was super excited to be asked by the lovely Elena of Sew It With Love to pattern test her debut sewing pattern, the Delia Top in November, and finally I can post about it and tell you all how much I love it! 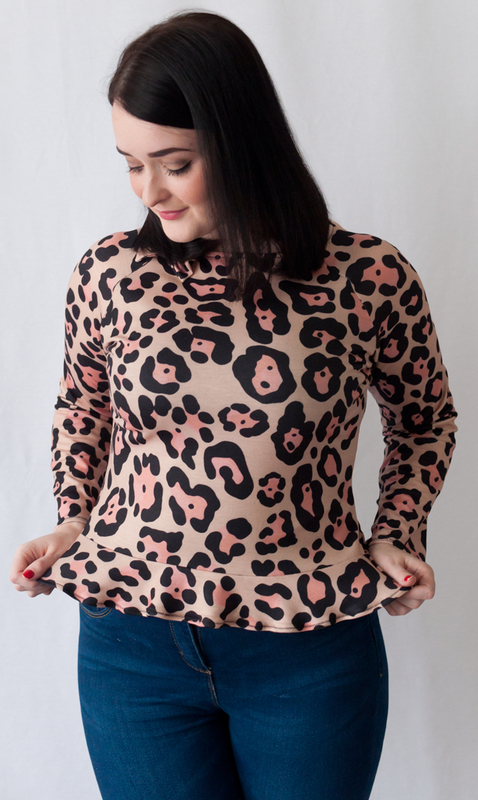 Delia is a lovely jersey top pattern with raglan sleeves with short and long sleeve options with cute length variations, including a flattering peplum shape and even a finishing bow! I knew I was going to love this. Who could resist that bow? 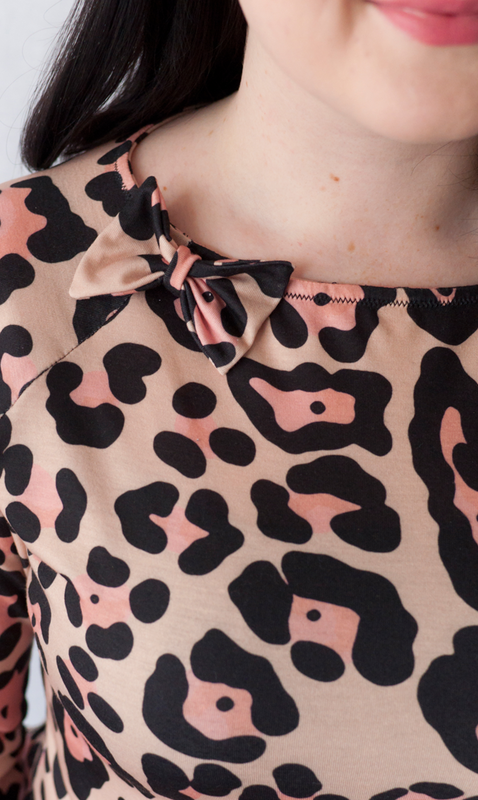 For my version of the Delia top, I chose Version 1, the peplum option with long sleeves and I had to make that bow! 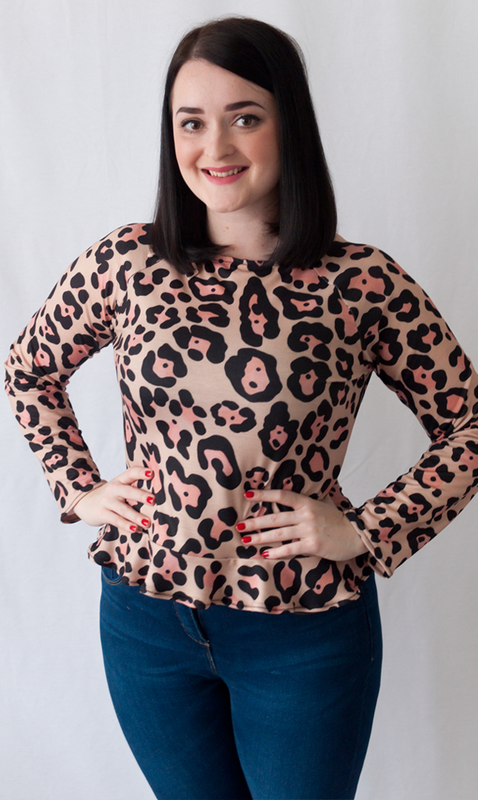 I've also been saving THIS leopard print jersey in my stash, waiting for the perfect garment, and this was it! I'm so glad I used it for the Delia top as I love the outcome. A lovely new take on a plain jersey top! The instructions were easy enough to follow, and having recently made the Tilly and the Buttons Agnes top, the techniques used when sewing the neckline were very similar and helped during the sewing process. I think the neckline looks really tidy and the raglan sleeves are a new style for me, which I enjoyed sewing. Finished with my favourite mini zig zag top stitch! Me and this bow were meant to be. I think it's a lovely touch to this pattern. I also love the shape of the top. I find the peplum to be flattering on my shape, and will definitely be sewing the pattern again. I think next time I might make the peplum slightly longer and shorten the bodice so it's sits on my waist. Sewing time: A couple of hours, or half a day with a tea break. Fit: Really good. 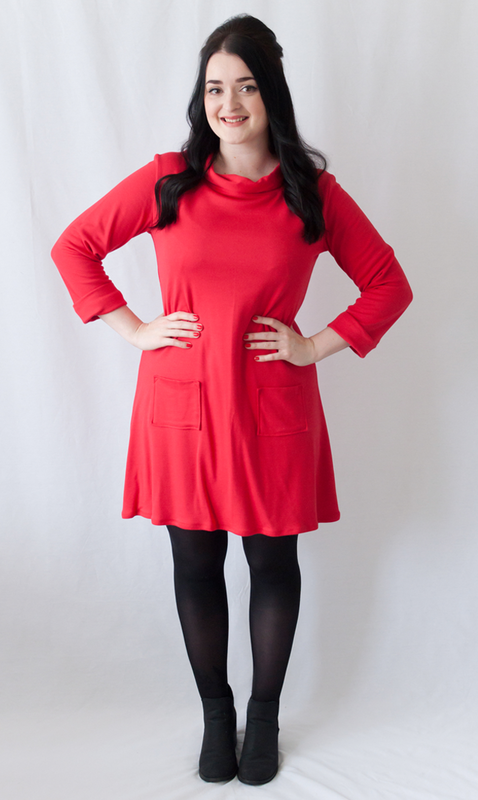 Great sleeve length, great fit across the bust and a nice shape at the waist. Difficulty: Simple! A great pattern for those venturing in to jersey. Watch out for: Make sure you stretch the neck band when sewing. It may take a couple of times to get it perfect, but it's worth it! Make Again? : Yes! I'm so happy to have this pattern in my stash. It was simple, fast and looks really cute. Tada! 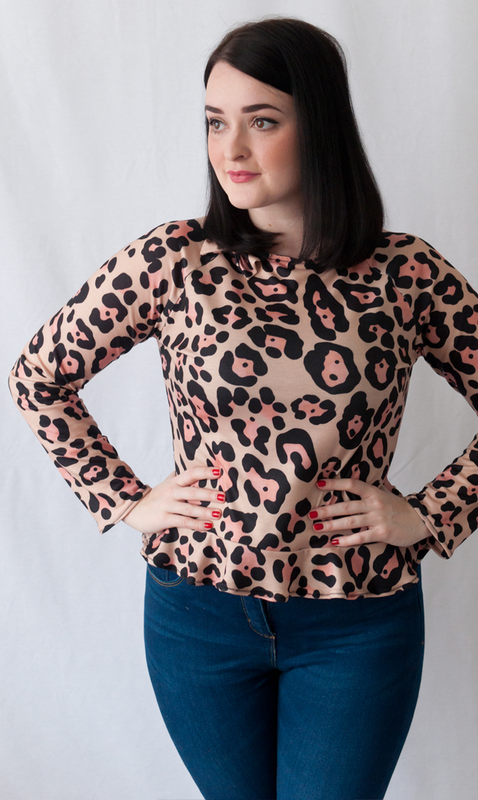 A purrrfect jersey top! Overall, I love this pattern. 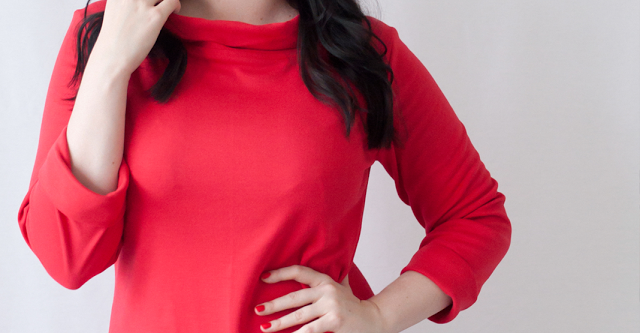 It's everything I want in a jersey top; flattering, simple and with some great variations. I know this will become a staple in my handmade wardrobe. The pattern was supplied to me free of charge by Sew It With Love for purposes of review. All thoughts & opinions are my own. My Sewing Year in Review 2016! Hi pinups! It's almost the New Year and I thought I'd do a little 2016 year in review post to reflect on my blog's highs and lows and what's in store for 2017. 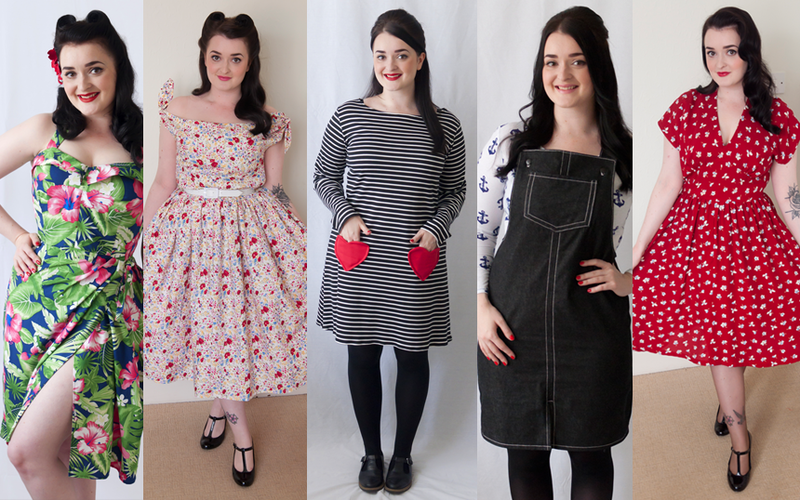 Firstly, a huge 'thank you' to all those who have followed The Crafty Pinup retro sewing blog so far. 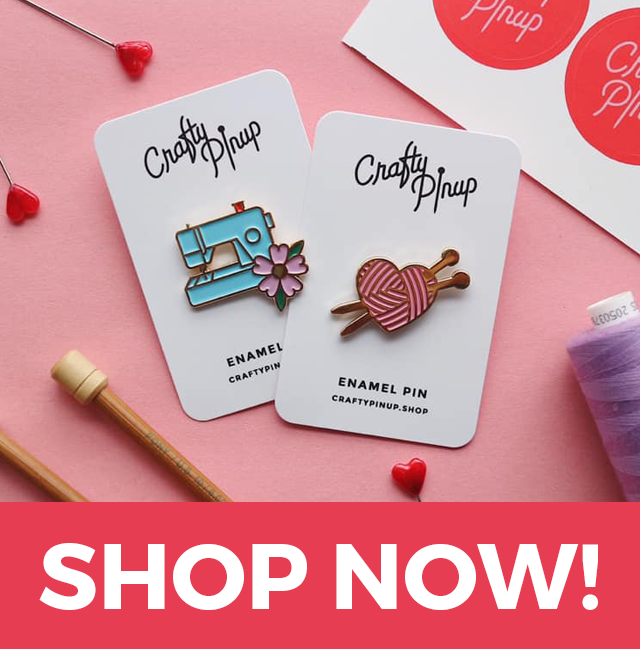 I started this blog back in April, hoping to improve my mental health by creating some important 'me time' with selfish sewing and contributing to this wonderful online community. The fact that anyone has chosen to follow my ramblings and check out my creations is wonderful! I was going to include the changes I've made to my work space in this post, but I'm going to save it for another post with a potential workspace tour to go with it. 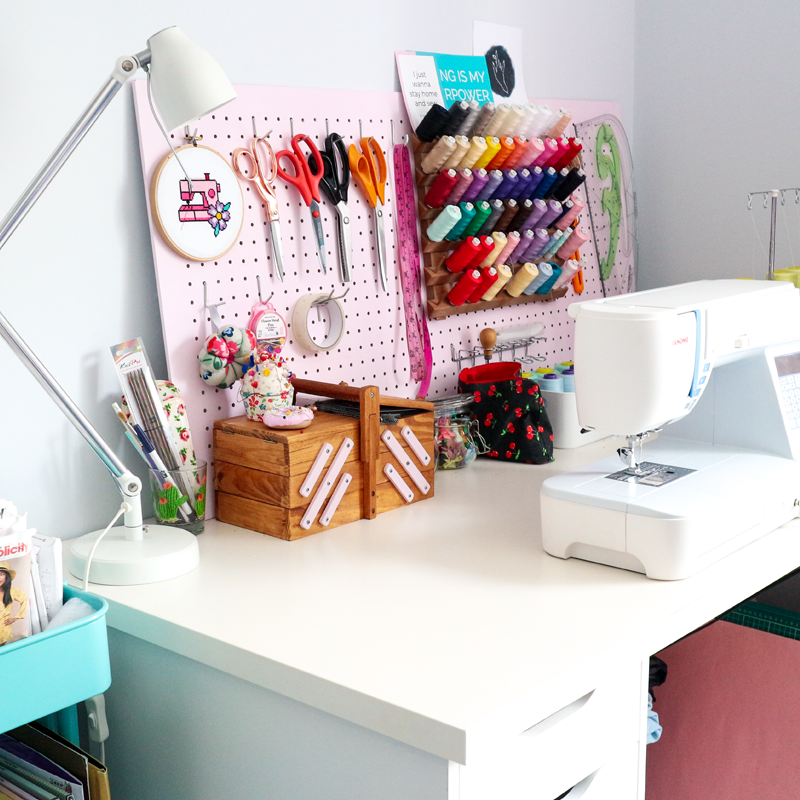 My sewing space & office space have changed so much this year, I think it deserves it's own post. A vast improvement! My first post to my most recent. 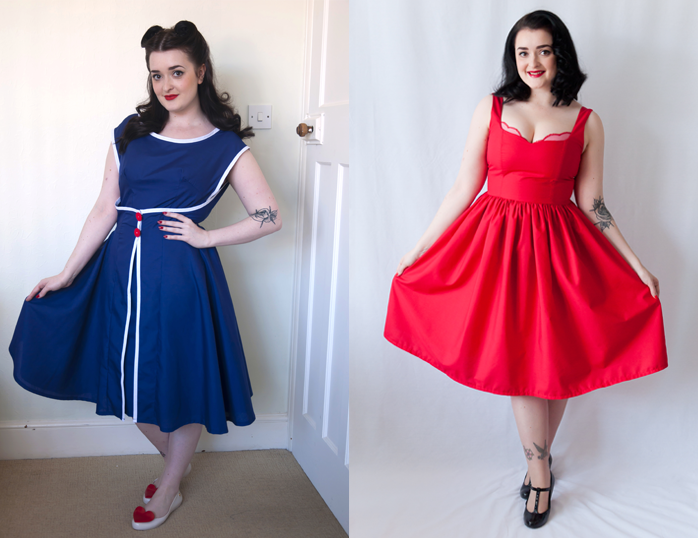 BY HAND LONDON - KIM DRESS - THE PINUP-PERFECT PARTY DRESS! Along with the way I work, the way I photograph my makes has certainly improved! 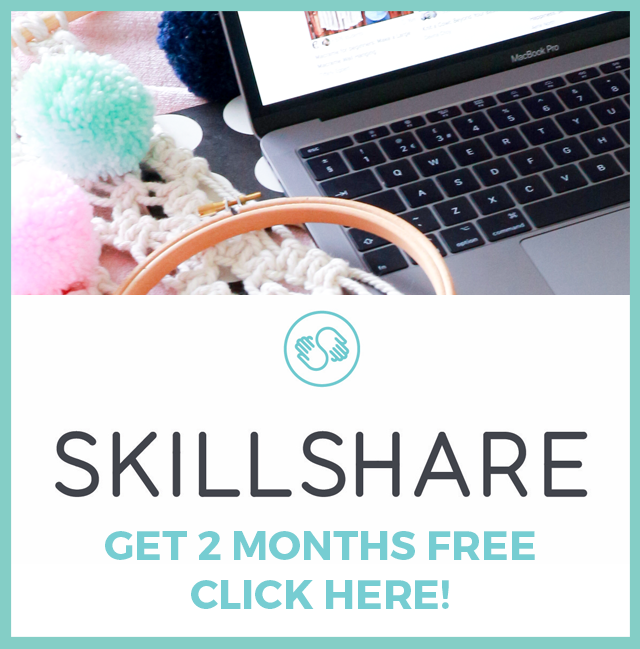 For me, I love blogs with bright, clear and colourful photography and I wanted to achieve that with my sewing creations to show them at their best. None of this would be possible without the help of my very handy boyfriend who always wants me to strive to be my best. He deserves a mention (he did my blog & My Retro Closet branding too) and doesn't complain when every other weekend I tell him it's photoshoot time and put him to work! According to my blog's stats, these are my most popular posts of all time! 3. 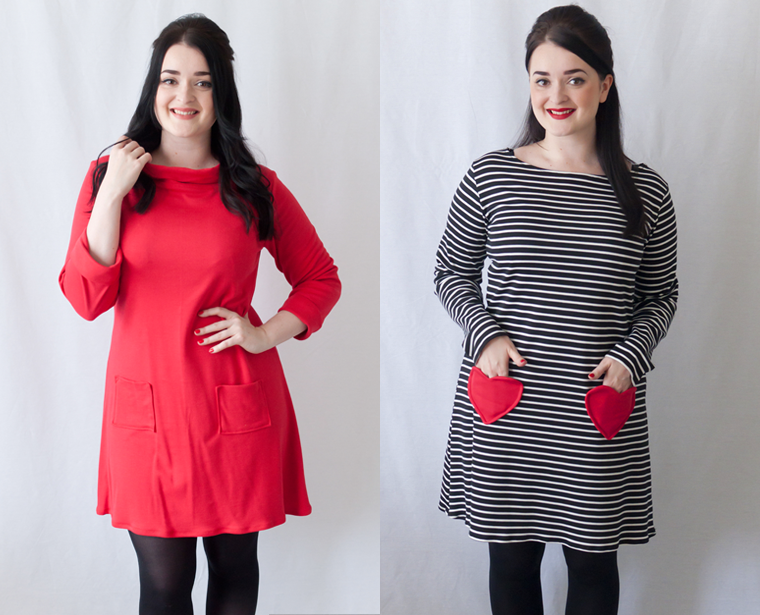 TUTORIAL: HOW TO SEW HEART POCKETS - SWEETEN UP ANY MAKE! I love what's turned out to be my top 5 posts. 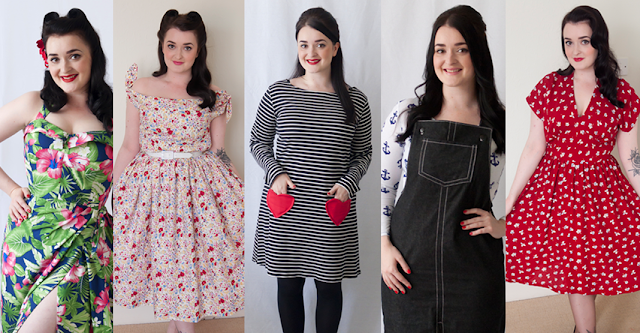 It's such a mix of styles and really represents my varied sewing. It's also great to see how popular the Retro Tiki Collab and my first sewing tutorial were - I might just have to do more next year! I had to include the Retro Tiki Collab in my highlights, it was so fun to take part and I created an outfit that pushed me out of my comfort zone, both skill and style wise. 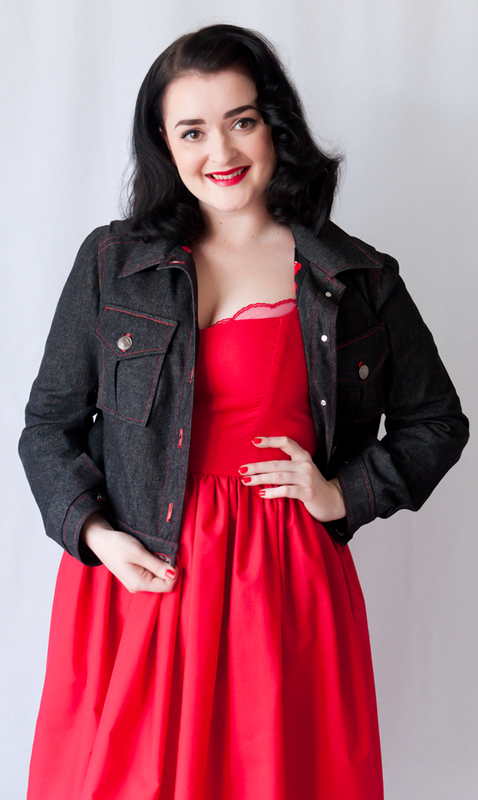 My second highlight is my jacket, and whilst it certainly isn't perfect, the fact I made a denim jacket makes me feel all proud! 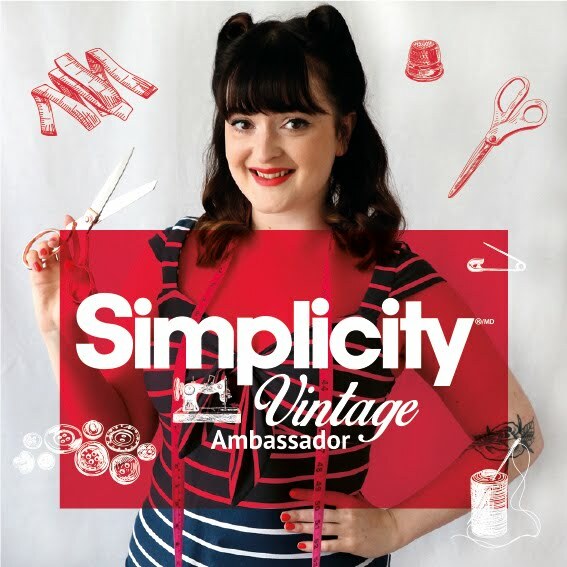 Lastly my vintage entry for the Simplicity Sewing Challenge, whilst I didn't win (but came highly commended), I really love this dress. I made it out of a vintage bed sheet, and as it was made towards the end of the Summer, I didn't get much chance to wear it so I'm looking forward to warmer months and getting this dress out! It's also featured in Issue 3 of Sew Now magazine, seen HERE. 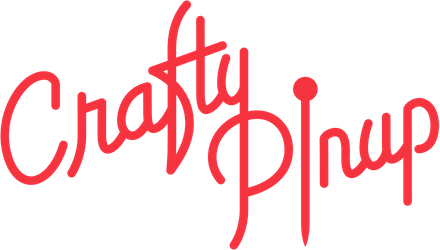 Another highlight I have to mention was being interveiwed about The Crafty Pinup on BBC Radio Shropshire. Such a random/amazing day! Firstly, I love the Burda 7179 pattern, it's just me that's the problem. I chose an interfacing that was waaaaay too firm and it makes the dress practically unwearable because it's so uncomfortable. I tried in the Summer, but honestly it feels like cardboard, But I am NOT done with this pattern and it WILL be third time lucky!! Second is my Martha dress, again it's me and not the pattern. I went to wear this recently and I'm really disappointed with the fit and fabric. In hindsight, the fabric is too thin for this dress, my waist seam has slipped all over and isn't flattering with a bulking zip. Even a belt doesn't save it. The shoulders are also way too wide. 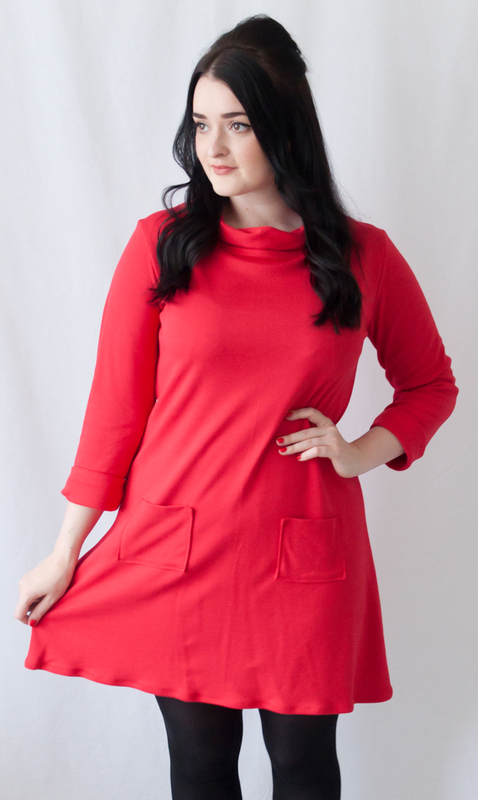 However, I recently bought a medium weight crepe and am planning on refitting this pattern to create the perfect Martha for my shape, so stay tuned for a post on that! Lastly, you are not mistaken, I have including my denim jacket as a high and low. I love this jacket and the pattern, but I'm gutted I made it too sizes too big. But as I mentioned in the pattern review, I'll definitely be getting this pattern out for round two this Spring! If you're still reading, thank you! I know I'm rambly. But I just wanted to again, say 'thank you' to those who have followed me here and on my social media. It's led to some fab new friendships, SO many amazing new bloggers to lust after and has improved my work/life balance. I've also worked with some wonderful haberdasheries and pattern designers which have enabled me to try my dream projects. On top of that, I'll be popping up in 3 amazing sewing magazines in January and continuing to be part of the Minerva Craft Blogger Network and posting on We Sew Retro and The Fold Line. Along with many, many more ventures in retro sewing of course. Hi pinups! 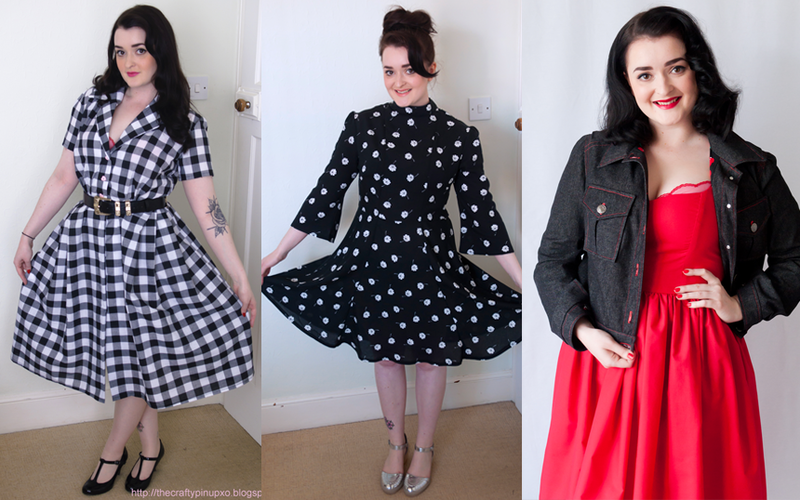 To round up this year's sewing pattern reviews, I thought I'd end on a festive note with my By Hand London 'Kim' Dress! The perfect dress for pinup-perfect party style this Christmas. Such a simple, beautiful shape. I was first introduced to this pattern over the Summer via Instagram, watching these beautiful 1950s looking Summer dresses popping up. I knew I had to have this pattern. It's the shape of the bodice that caught my eye. 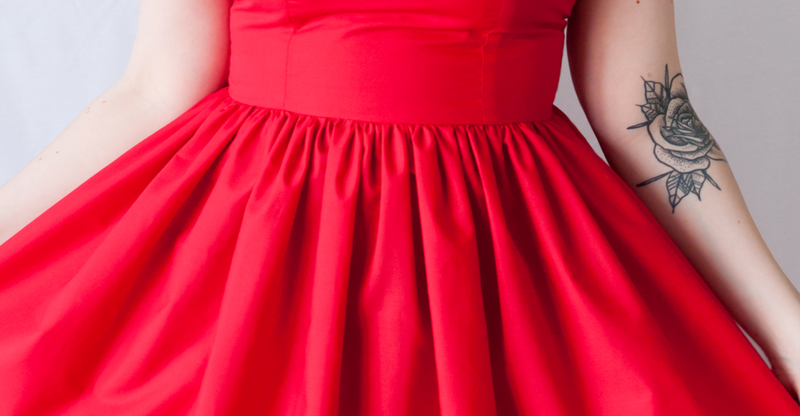 It looked super flattering, with classic princess seams and a sweetheart neckline. But it wasn't until the Autumn that I picked up the pattern and plotted my first version! 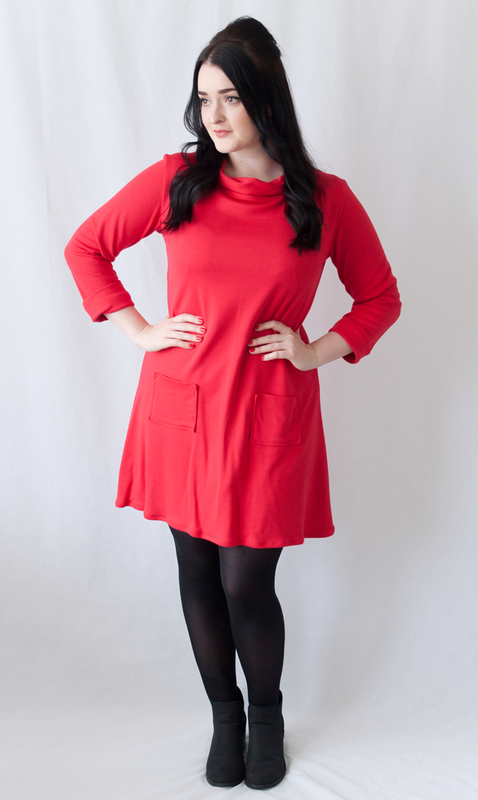 You may have spotted this dress in my previous sewing pattern review! For my version of the Kim dress, I wanted to keep it simple for my first attempt. I was quite aware I may have some fit issues, whether it be a long bodice or straps and most likely be too tight across the bust. So to avoid disappointment I approached this make as a wearable toile and chose an affordable cotton poplin fabric. THIS fabric is my go-to for toiling and there's so many colours to choose from, if you're lucky enough to end up with a wearable garment, it works out quite nicely! This was my first time sewing with a By Hand London pattern. The packaging is beautiful and I found the instructions clear and easy to follow with helpful illustrations. For reference, this dress is very similar to the Tilly and the Buttons Lilou dress, which I reviewed HERE. So lets start with the obvious, this dress is too tight on my bust. I should of known! I can just about get away with it, and I like it styled with a pretty bra. But I'm not sure how comfortable I'd be going out and about this exposed! However, I LOVE this pattern. With a full bust adjustment, I'm going to love it even more. I do also find it slightly long in the body as there's extra room in the straps. But I won't shorten the bodice, I'll just take an extra centimetre off the straps and maybe heighten the bodice at the top. Sewing time: Half a day. Fit: I know I'm going to love the fit of this dress even more with a full bust adjustment. Watch out for: Getting even gathers and under-stitching the lining of the bodice. Make Again? : Yes! 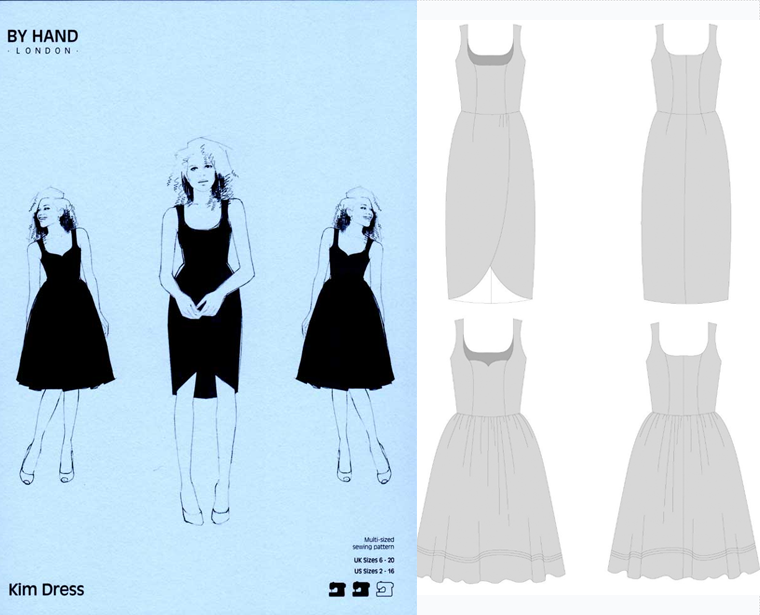 I see this pattern being my go to Summer dress pattern once I made the bust adjustments. Simple, pretty quick and a gorgeous result! Tada! A pinup perfect party dress! Overall, I can't express how much I love this pattern. It's a shame it's too tight on the bust, but I will certainly take the time to redraw the bodice and make a full bust adjustment as I know this will be a wardrobe staple for me. Thanks for reading, pinups! Have you tried the 'Kim' dress? It's time for my second Minerva Crafts Blogger Network post, if you missed my first post all about my land-girl inspired Grainline Studio Archer Shirt, check it out HERE. For my December make, it seemed appropriate to sew up a nice pair of pjs to spend Christmas in and the Closet Case Files Carolyn Pajamas have been on my wish list for quite some time. Sewing time: I spent two about afternoons on this. Difficulty: Like I said, I found the instructions a little dense, but the illustrations helped. I'd recommend this pattern for confident sewists. Watch out for: Precise collar and piping sewing for a crisp and neat collar (mine could certainly be improved!). Make Again? : Yes! I love this pattern and look forward to making it again now I understand the pattern better. Cosy flannel here I come! I hope you like my take on the Carolyn Pajamas! Want to know what I'm sewing for January's Minerva make? See my plans HERE. I'm taking it back to the 1950s with this rockabilly look! And hey new hair cut! Blimey, I sure did take my time sewing up this jacket! 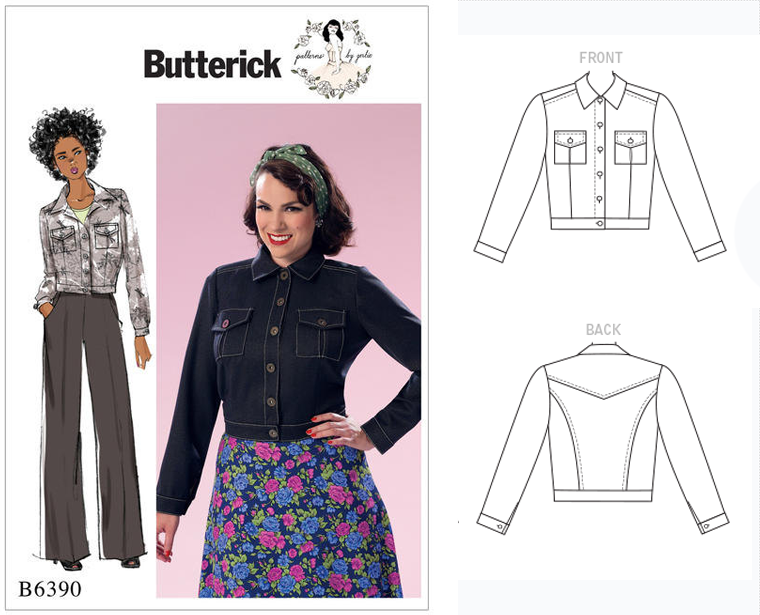 The wonderful Sew Essential sent me the supplies for this new Butterick Patterns by Gertie B6390 jacket pattern a few months back when the pattern was first released, after I'd been tweeting/Instagram-ing my undying love for the pattern whilst trying to find out when it was coming out in the UK. Along with the pattern, I kindly got to choose the fabric for my jacket. 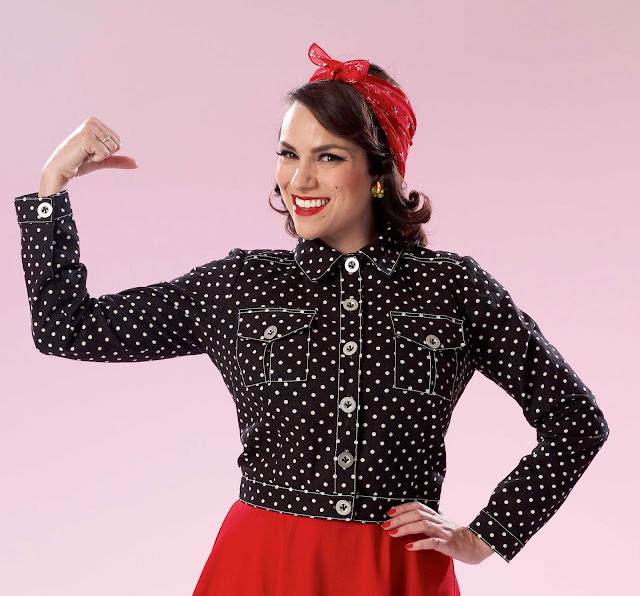 Sew Essential have such a great range of quality fabrics and I knew I wanted a classic black denim with a colour-popping lining and I found exactly what I wanted! Such a great style to sew yourself! 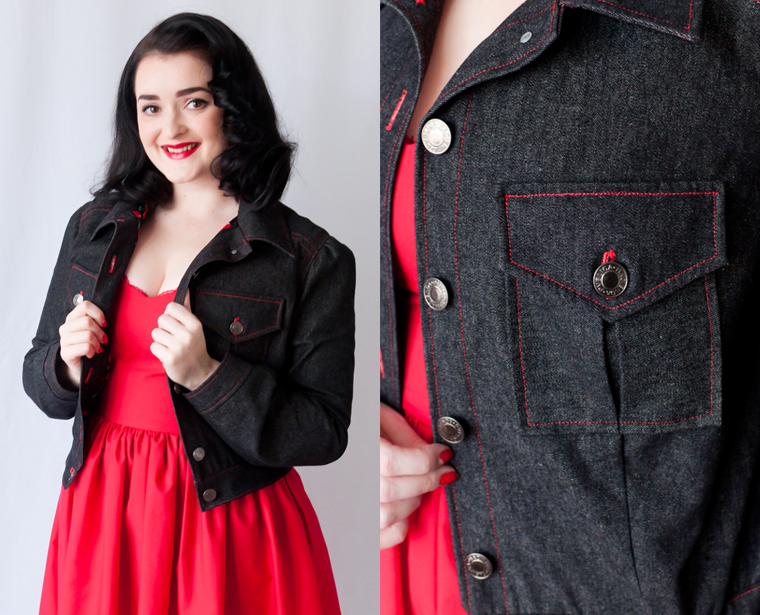 For my version of the jacket I chose a medium weight black denim, you can also see it HERE for my Tilly and the Buttons Cleo dungaree dress, it's a really great fabric and I know I'll be wanting more! 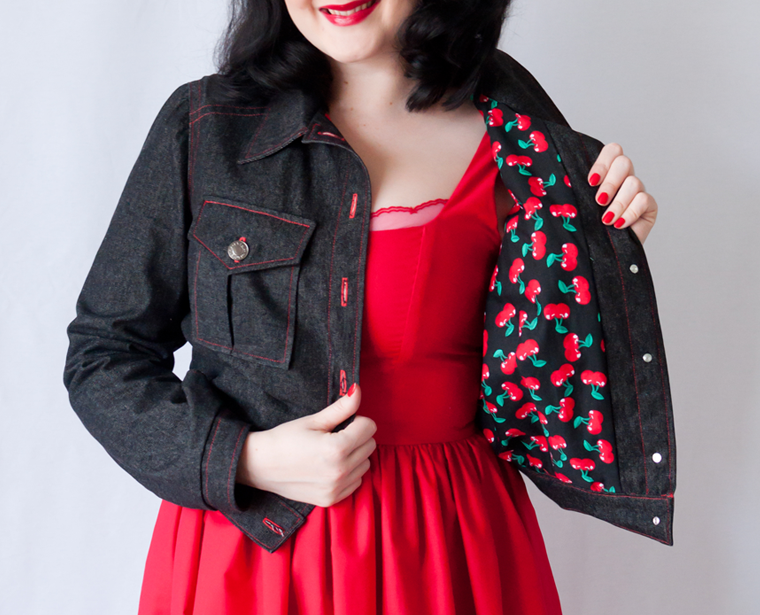 For my lining I decided on a cherry printed cotton which inspired me to do red top stitching for a classic, rockabilly style denim jacket. The main thing that made me fall in love with this pattern was Gertie's polka dot version. I'm obsessed with it and am totally planning to copy it in the Spring! 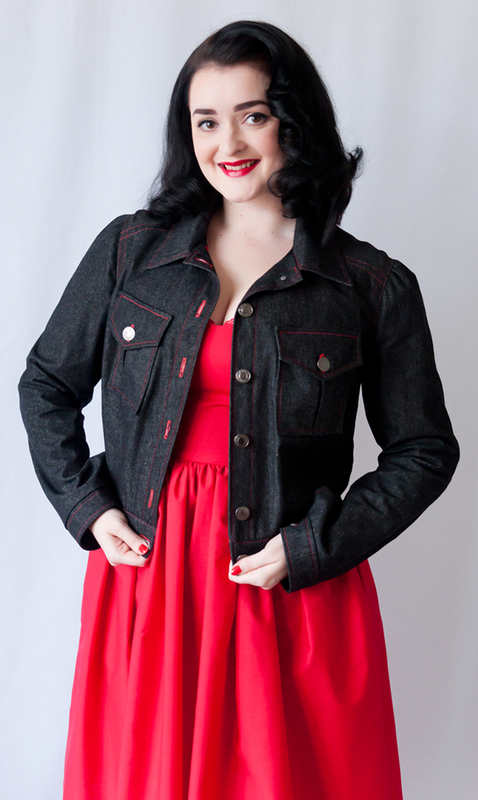 Gertie's 1940s Rosie the Riveter inspired jacket! Check out Gertie's own inspiration on her blog HERE. So let's talk about the sewing. 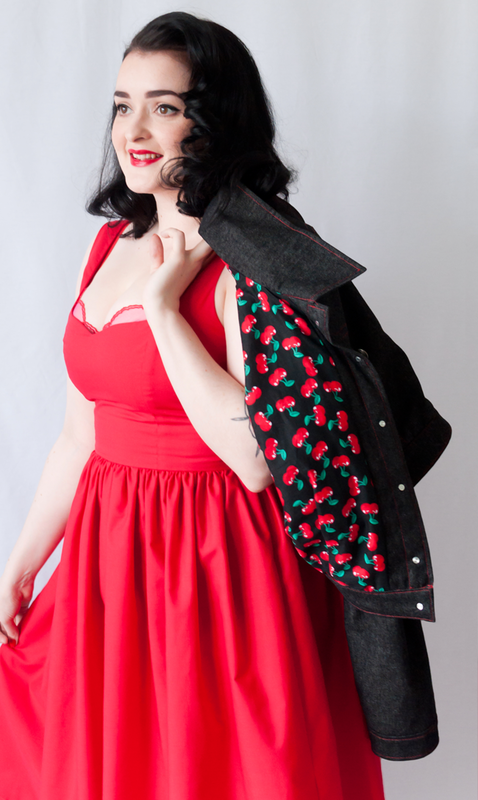 I've not made a jacket before, but have made a few garments with shirt collars and a couple of lined dresses so I hoped I'd be able to figure this one out! I was pleasantly surprised with instructions and found them really easy to follow. 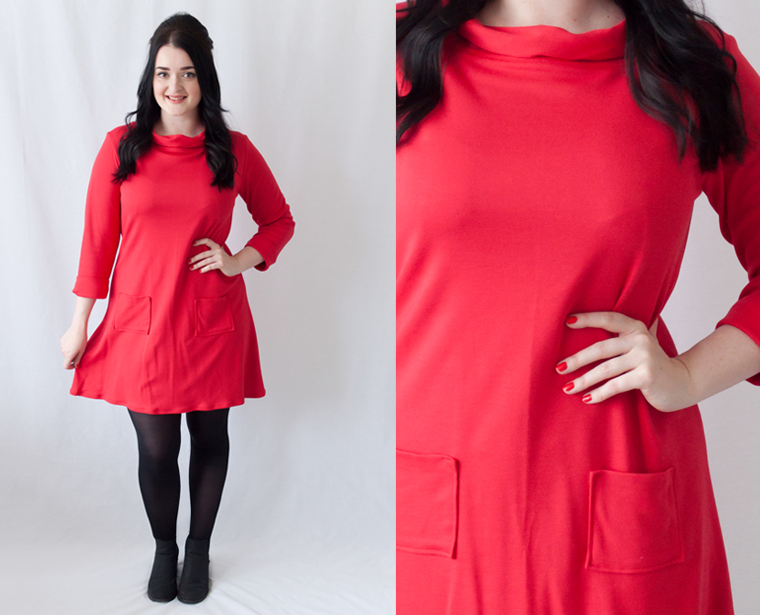 If you've read a few of my pattern reviews, you'll know I like a simple, one-sew pattern. However this has been the first make that remained a sewing UFO for a couple of months. Personally, I HATE setting in sleeves. So once I'd sewn and lined the body, for some reason the sleeves just made me shelf the project for a few days, then a week passed.... Eventually I got there, but did sew this in stages over a couple of months. It was my sewing project that was continuously ticking away in the background. Top-stitching takes time, especially when it's such a contrasting colour. The right buttons make all the difference! I didn't find any of the sewing too challenging and would recommend this for intermediate sewists or even beginners with a few projects under their belt, looking for a challenge. Once the majority of the jacket was sewn, buttons became my on going nightmare. I bought 4 separate lots of buttons for the jacket and just couldn't find the right ones! I got there eventually, but this was the main reason it's taken me so long to finish. But I'm glad I didn't just sew on the first ones I bought as I love the ones I eventually used. Jacket too big, dress too small! Featuring my me made 'Kim' dress by By Hand London. Review coming soon! Sewing time: Drips and drabs over a couple of months. However if I was a good sewist, I think I could have made this in a couple of days. Watch out for: Tidy topstitching and the right buttons can make the world of difference on something like this! Overall, I'm pretty happy with this jacket. I'm proud of my lining and think this jacket has a surprisingly professional look (even if I do say so myself...). Although it's a little too cold to wear this jacket at the moment, I think it'll be great come Spring. I'd love to make Gertie's polka dot version! And of course, I want to work on the fit and sew this pattern again with more confidence. Alas, I am always learning! Have you tried this pattern? I also have Gertie's B6380 tea dress pattern which came out at the same time, but am yet to make it. I'd love to see your versions if you've tried either. The fabric and pattern were supplied to me free of charge by Sew Essential. All thoughts & opinions are my own. Starting December with a splash of cosy red! 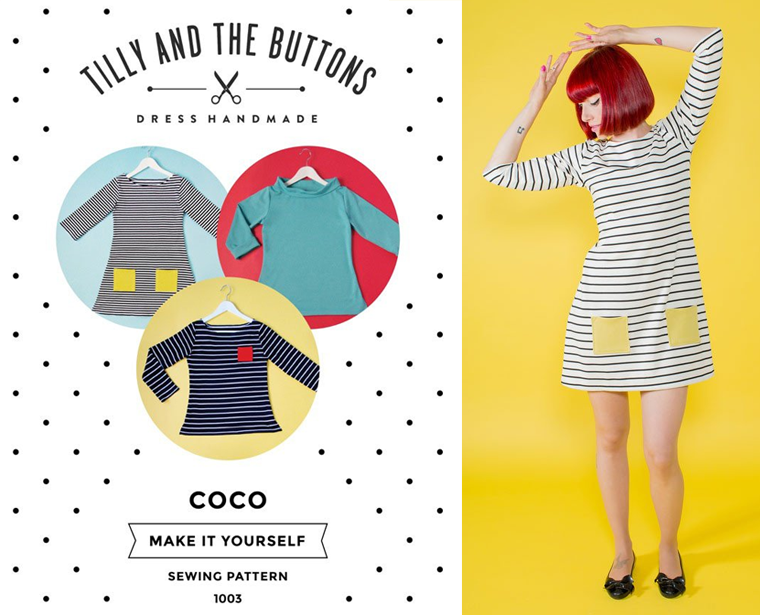 I love the Tilly and the Buttons Coco pattern. I've made a handful now and I did plan on doing a big ol' blog post with them all together. 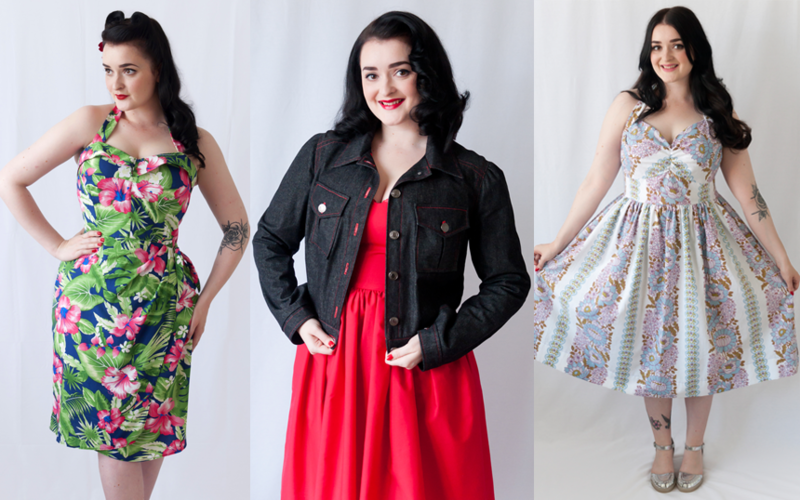 But I'm super busy sewing orders over at My Retro Closet in the run up to Christmas, so I thought I better spread out my makes for some more blog content through the festive season! As I'm finding I don't have so much time for selfish sewing this time of year, I look towards fast, simple and practical sewing patterns that I can whip up to take a break from sewing lingerie. 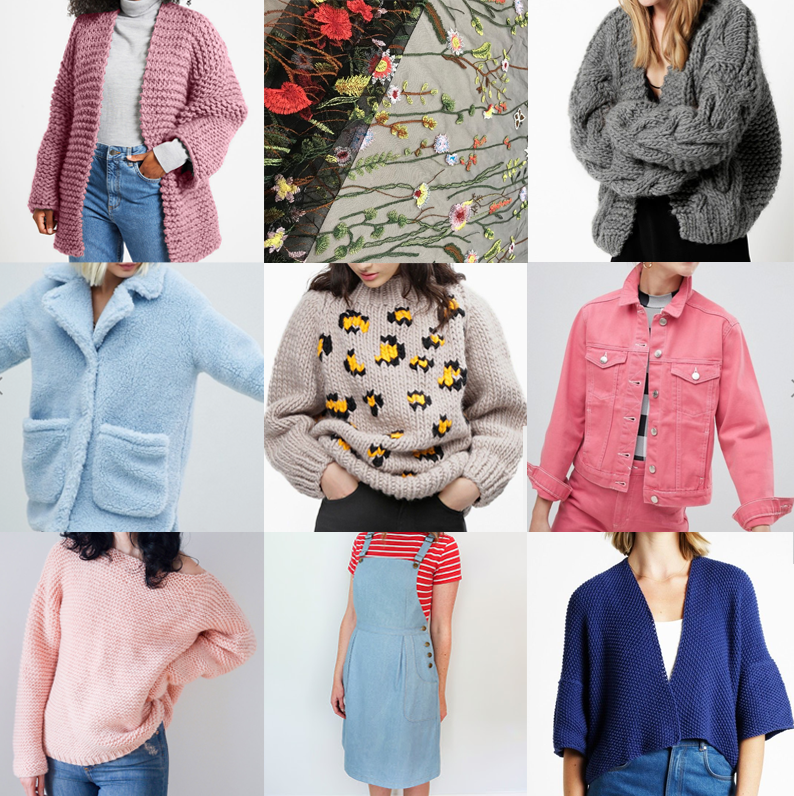 But also, this time of the year I need cosy jersey to keep me warm and comfy whilst I work from home and Coco is becoming a wardrobe staple - like it is for many sewists. So versatile - you can see why it's so popular! On a recent trip procrastinating to my local haberdashery, I found this gorgeous thick jersey/ponte roma hidden in the sale section and I had to get it! It's just the right thickness for Coco, as it holds it shape well but still keeping some swish but most importantly, is also warm to wear! This style certainly has a 60s vibe which I LOVE. For this Coco I opted for the version with all the trimmings! The neck band, arm cuffs and two front pockets. I really love all the options with this pattern and it makes for a really versatile pattern. I also can't resist the 1960s vibe of this pattern - it ticks all the boxes for me. Definitely should have ironed it.... oops! As always, Tilly's patterns are super easy to follow and Coco is one of the best! 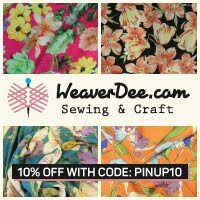 Search #sewingcoco on Instagram and browse the 100s of versions people have created. I highly recommend this pattern to beginners or new-to-jersey sewists. But of course it's a lovely, simple make for every sewist. Sewing time: A couple of hours with jersey sewing experience. Watch out for: Nothing I can think of! Make Again? : I have and I will again! If you've been following my blog for a little while, you might have seen my How To Sew Heart Pockets Tutorial featuring another one of my Cocos. Cute pockets are a great, creative way to personalise your garment. Check out my first (super easy) sewing tutorial HERE. Tada! A suitably festive, red Coco. Anyway, how many Cocos have you made? I hope you like this version.